Thule has been a world-renowned name in the active family space for years—if you needed a multi-sport bike trailer or backpack carrier, Thule was your go-to. 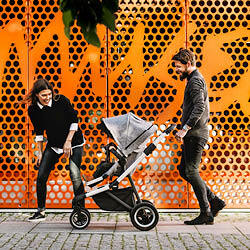 And now they’re launching their brand new stroller, the Thule Sleek. Made for the active families, it’s highly adaptable as your family grows and comes with a plethora of customizable configurations and accessories. Thule’s commitment to the environment and sustainability (they plan to have 100% of their electricity come from renewable sources by 2020) is unparalleled, as is their work with organizations worldwide that help children and adults with disabilities. Find out more about Thule. Having provided Europe with amazing, eco-conscious furniture for over 40 years, Micuna’s beautifully designed, handmade items are quickly making a name for themselves here in the US. Well-made from sustainable materials (like beechwood) from sustainable forests, Micuna is also committed to creating furniture in the most efficient and eco-friendly way possible. 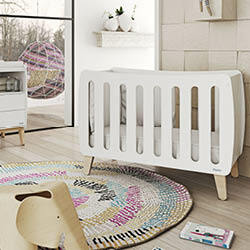 You’ll win their lovely Harmony crib; designed with longevity in mind, it can even be converted to a twin-sized bed (when your kiddo is ready to make that leap). Find out more about Micuna. Bundle of Dreams, a mattress company created by a dad with three generations of mattress-making knowledge, believes that healthy, safe sleep should be easily accessible by all families. Their mattresses are 100% breathable, hypoallergenic, and foam-free, with zero VOCs, PVCs, emissions, and chemical flame retardants. And did we mention they’re also water repellent and come with a lifetime warranty? Plus, for every purchase of a mattress, a donation is made directly to St. Jude Children’s Research Hospital. You’ll win a 6″ dual-sided crib mattress and extra cover. Find out more about Bundle of Dreams. ABBY&FINN is a new diaper subscription service that has everything you want in a disposable diaper—like multiple sizes in one box—and nothing you don’t—like chlorine, heavy metals, latex, known allergens, or dyes. Made with sustainably sourced wood pulp, you can rest assured they’re good for your baby’s bottom and the planet. 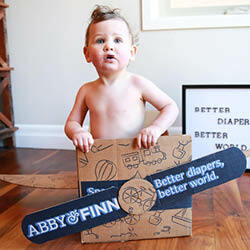 And here’s one more reason to feel good about all those diaper changes: with each monthly subscription, ABBY&FINN donates diapers to families in need. In fact, every time you receive a box, they donate 30 diapers in the U.S through their partnerships. As our lucky winner, you’ll receive a year’s subscription of diapers. Find out more about ABBY&FINN. Medela is a world leader when it comes to advocating and providing products and services for breastfeeding moms. 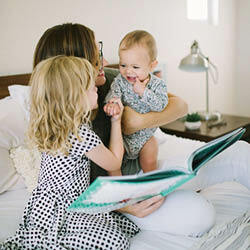 Their commitment to helping moms be successful in meeting their breastfeeding goals—whatever those may be—can be found in Medela’s free support resources, like The Mom’s Room or Ask the LC, and their Medela Cares includes programs with mission-aligned partners. As a result, Medela has supported more than 100 organizations across the U.S., such as Ronald McDonald House Charities, March of Dimes and the Good+ Foundation. You’ll win a breastfeeding bundle, including a Sonata Smart Breast Pump, a Harmony Manual Breast Pump, and amazing accessories like milk storage bags, Hydrogel pads, and more. Find out more about Medela. Besides having adorable prints for their hats, footies, pjs, mitts, and booties (and being a ultra-soft mix of organic cotton and bamboo), buying Goumikids products has another feel-great perk. 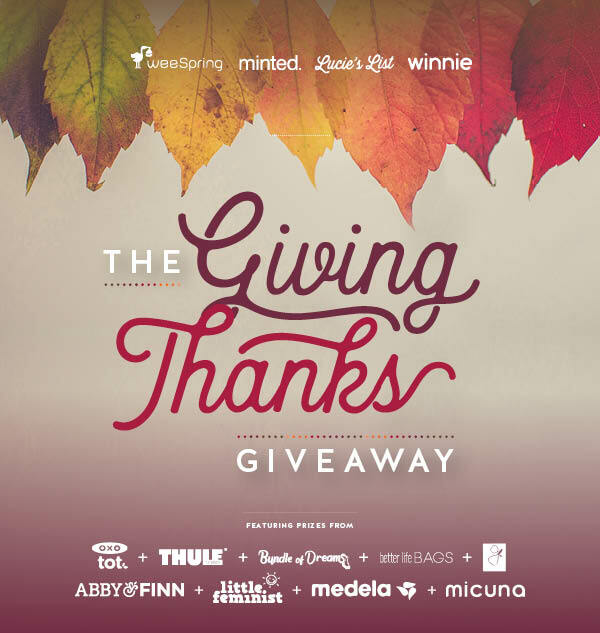 10% of all of their profits and 100% of all of their GoumiGiving products go to their charitable partners like India Partners and Solid Ground International, who help survivors of human trafficking receive food, clothing, counseling, and education to help them heal and lead dignified lives. You’ll win a newborn smart box PLUS a $175 shop credit to nab additional goodies for your little one. Find out more about Goumikids. OXO Tot is known for its innovative products that help to make everyday tasks easier—a must for parents everywhere, so it should come as no surprise that their philanthropic commitments are kid-related. Through their partnership with Cookies for Kids’ Cancer, OXO donates time, energy, and funds every year to this worthy cause. 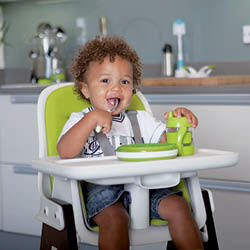 You’ll win their award-winning Sprout Chair, which converts from a high chair to a youth chair (tool-free height and depth adjustments are a cinch! ), plus a curated selection of feeding must-haves, like bibs, utensils, and more. Find out more about OXO Tot. Dedicated to the premise that empathy will change the world, the Little Feminist Book Club fosters the idea that books must encourage all kiddos to be exactly who they are—brave and kind. They also partner with organizations like We Need Diverse Books that encourages changes in the publishing industry to produce and promote books that reflect and honor all kids. You’ll win a year’s subscription of diverse books and activities curated by parents, teachers, and librarians that help foster empathy and thoughtful conversation (don’t worry, they’ll even provide you with a handy discussion guide!). Find out more about Little Feminist Book Club. This custom handbag company based in Detroit has an amazing collection of bags you get to design on their website. From the color of the 100% genuine leather to the hardware, fabric patterns and interior lining, it’s simple to style a head-turning bag that you’ll use long after the kids are out of diapers. What we especially love about this company is that each bag is hand cut and hand sewn by women who have various barriers to employment, giving them a chance to learn new skills and make money to support their families. 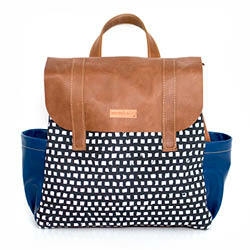 You’ll win a $150 gift card to design your own very own custom diaper bag. Find out more about Better Life Bags. Minted’s design marketplace features the work of independent artists from around the globe, making it easy to find a truly one-of-a-kind style for you. A favorite of weeSpring parents, it’s also a one-stop shop for home decor, stationary, invitations and announcements, as well as elegant party decor. Whether the living room needs a touch-up or you’re decorating a nursery, Minted has beautiful pieces that are almost as unique as your little one. 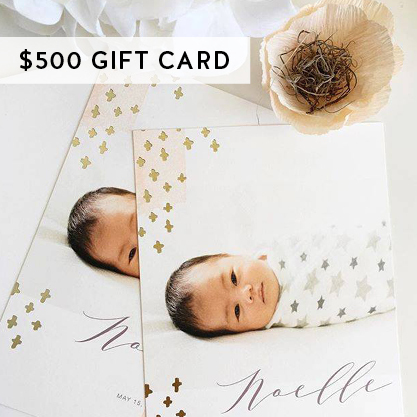 As our winner, you’ll receive a $500 gift card to shop Minted’s design marketplace. Prize value is $4,042. For more information, please see our terms and conditions.